To the east of Winnipeg lies the Red River Floodway, a 47km long channel intended to prevent disastrous flooding in Canada’s 8th largest city. The arrival of spring in the northern hemisphere leads to flood alerts in many areas as snow melts and rivers rise. The Red River is renowned for causing flooding in the US states of North Dakota and Minnesota. It is Winnipeg, however, that is most threatened by this river. A terrible flood in 1950 led to construction of the Floodway from 1962 to 1968. At the time it was the world’s largest earth-moving project, bigger even than the Suez Canal. Since completion it has been used more then 20 times to protect the city’s almost 700,000 residents from flooding. Control gates south of the city divert water into the Floodway when forecasts indicate that flooding could occur. The channel and dikes can contain flood water flowing at 2,550 cubic metres per second safely around the city and back to the river at Lockport. 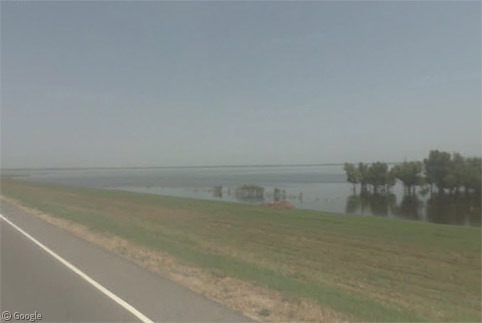 The 1997 flood tested the Floodway and other dikes to their limit. Construction is currently underway to expand the channel to a capacity of 4,000 cubic metres per second. This would accommodate a “1 in 700 year event” in the terminology of the Floodway Authority. The CBC Archives have good information about the 1950 flood and the construction of the Floodway. Other flood-prevention systems previously featured on Google Sightseeing include the Thames Barrier in England and the Delta Works in the Netherlands. One of the issues that causes the Red to flood in the spring is that it is one of the few major rivers in the populated south of Canada that flows north. In the spring, the snow and ice melts in North Dakota and Minnisota and starts to flow north into areas where the ice has not melted yet, causing dams backing up the river. Another one of the interesting pieces about the Floodway is the fact that the Seine River actually flows under it. You can see it disappear on the south side of the floodway and reappear on the north side. If you are interested, I found this very nice collection of photos relating to the Red River flooding.